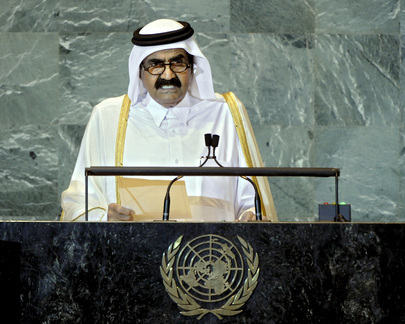 SHEIKH HAMAD BIN KHALIFA AL-THANI, Amir of Qatar, said he came from a region with great expectations that was navigating strong currents, whose peoples were calling for reform. They hoped to achieve their goals, assume their responsibilities and take their place in the partnership of the future of mankind. Qatar supported the promotion of dialogue among cultures and civilizations, the strengthening and consolidation of relations among peoples and the consolidation of “rapprochement among Powers”, on the basis of international charters and covenants. He said that the “blossoming of the Arab Spring” — with all that it represented in Arab and human history — had presented all Member States with heavy responsibilities to assume and positions they must take. On the one hand, Qatar had always had a clear policy with regard to the rules governing its Arab, regional and international relations, on the other hand, Qatar, as well as others, had been unable to turn a deaf ear or a blind eye to the calls of the wounded seeking help against an entrenched oppression. For its part, Qatar had exhausted all means, leaving only the option “to hear and sympathize, to see and help”. “We know that our choices of principle are stable and strong,” he continued, adding that the unrest needed to be settled on the basis of the rules and charters that governed modern international relations. The situation should shift the responsibility to act from individual States to the international community. In previous General Assembly sessions, Qatar had expressed its views that the United Nations system must evolve in line with the realities of a new world — a world conforming to the principles that governed “civilized behaviour”, while preserving the unity of interests.